When it comes to World War II, there are so many amazing films depicting the turbulent times the world went through before the Axis powers were finally defeated. 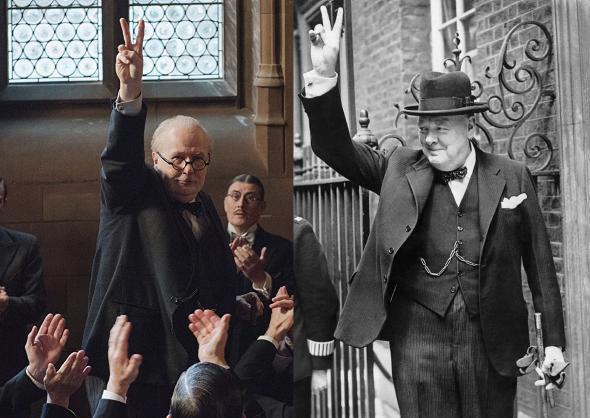 Gary Oldman, left, portrays Winston Churchill, right, in “Darkest Hour.” Courtesy photos. The latest in this genre is “Darkest Hour,” a British war drama directed by Joe Wright and starring Gary Oldman as British Prime Minister Winston Churchill. The film is an account of Churchill’s early days as prime minister while Nazi Germany rampaged across western Europe threatening to annihilate the U.K., as well as an inside look to the friction that nearly split the government apart. Oldman’s performance as Churchill has been highly praised, with many critics noting it as one of the best roles of his career. The film saw Oldman nominated for an Academy Award for Best Actor. He ultimately ended up winning a handful of awards, including a Golden Globe, a BAFTA Award and the Screen Actors Guild Award for Outstanding Performance by a Male Actor in a Leading Role. “Darkest Hour” also was nominated for six Academy Awards and nine British Academy Awards, winning two of them. The film commences in May 1940 as Churchill comes to power as prime minister. Overcoming a poor reputation, Churchill battles forces inside the British Parliament, faces criticism by the king and is tasked with stemming back the invading Nazis whose push to conquer western Europe brings about an existential crisis across the world. It’s a story that captures the reality of the arduous tasks Churchill faced, including a government that saw him as a fuddy-duddy old fool before they revered and loved him after the war. With outstanding supporting performances by Kristin Scott Thomas as Clementine Churchill, Elizabeth Layton as Lily James and Ben Mendelsohn as King George VI, “Darkest Hour” is a film that war buffs, history buffs and lovers of method acting and good writing will enjoy equally. The Panida Theater will be showing “Darkest Hour” Feb. 22 at 7:30 p.m., Feb. 23 at 5:30 p.m. and Feb. 25 at 3:30 p.m. Tickets are available at the door or at www.panida.org.